I liked this book a lot, but I think it ended too soon. I’m also hoping for more but I don’t like really like sad books. This a great book. but I didn’t really understand the role of Sadie though. Owen thinks about Sadie, but then what is he saying about the prom dance. this book should have a sequel to it. the ending is a HUGE cliff hanger. but I think I’ll vote for this one now. Keep up the great work,Mr.Johnston!!! The book was fine. In the beginning it was way too slow though. At the end the book was awesome. Keep up the good work,Mr. johnston!!! so true, Ayesha R. first i thought Sadie was a mean drama queen, but she turned out to be a nice girl. 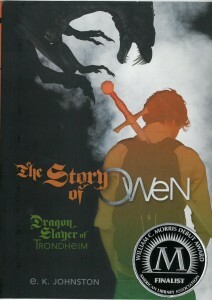 then she was interested in dragon slaying and Owen. so that’s why we need a sequel to the book. Because Sadie’s role is as mysterious as Snape’s from harry potter!! Has anyone heard about ”Praire Fire”, the sequel to story of Owen. you can read an excerpt on amazon.ca.